Colour Coded Bumpers, Colour Coded Mirrors, Rear Wash Wipe, Central Locking - Remote, Electric Mirrors, Electric Windows, Power Assisted Steering, Rear Head Rests, Radio CD, Service History, Low tax / Insurance, Any Inspection Welcome, Warranty, High level brake light, Touch Screen,,2015 15 Peugeot 108 Active 1.0 5 door hatchback, finished in gleaming Tahoe blue metallic with carolight cloth trim, Low CO2 emissions, Low mileage, Bluetooth system, Touch screen display, EPAS, USB socket, Steering wheel mounted remote controls, DAB Digital radio, 2 speakers + 2 tweeters, Manual rear window popouts, LED daytime running lights, Intermittent rear wash/wipe, Electric front windows, Body colour door handles, Body colour bumpers, Manual air conditioning, Isofix on outer rear seats, Height adjustable steering wheel, Driver seat height adjust, Auxilliary 12V power socket, 50/50 split folding rear seat, 2 rear head restraints, Tyre pressure sensor, Two 3 point rear seatbelts, Seatbelt warning lamp and buzzer, Rear door child safety locks, Passenger airbag deactivation system, Front side airbags, Front and rear curtain airbags, ESP with Hill Assist, Driver and passenger airbags, ABS+Electronic Brake force Distribution, Thatcham Cat 2 engine immobiliser, Remote central locking, 15" steel wheels, Space saver spare wheel.Supplied Serviced, and balance of manufacturers ***petitive Hire Purchase and PCP finance available, all major credit and debit cards accepted. This advert is for a Peugeot 108, click Peugeot 108 in Darlington to see more cars like this in the local area. Want to search further afield? 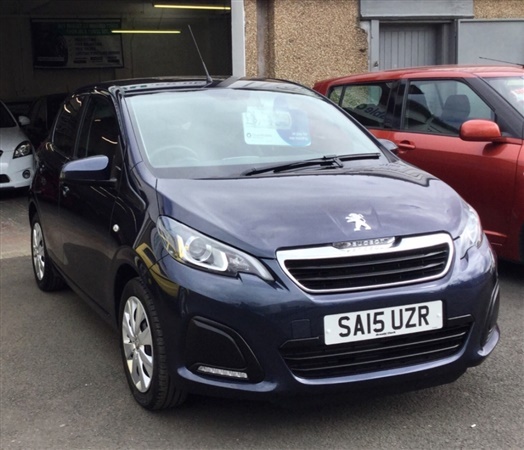 Click Peugeot 108 in County Durham to search for similar cars in the wider County Durham area.